Christopher Noel was featured in an episode of Finding Bigfoot, is the author of several books and even helped the Facebook Find Bigfoot guys out with their book. 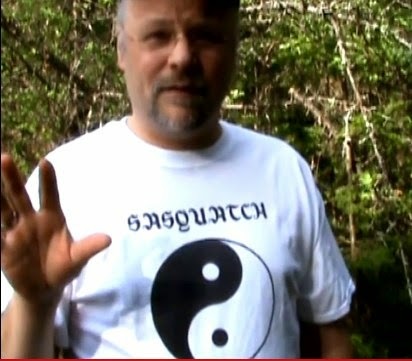 He is also well-known for his undying support for Rick Dyer's Bigfoot hoax. He was instrumental in keeping the hoax alive and giving it legs. Whether Chris was just extremely gullible, or was trying to obtain monetary gain out of all of this is still debatable. After attending the premiere screening of Shooting Bigfoot in Canada he still backed Dyer 100%!? Being a highly educated Bigfoot researcher (he went to Yale) he was looked upon somewhat highly in the Bigfoot community. That was before his aligning with Dyer. When everyone else already knew it was a hoax, Chris stood by him. So basically his credibility in the Bigfoot world is shot. He has been relatively quiet as of late, but here we have him in this video pitching a new movie idea. What do you think? Is Chris on to something with this concept? yep, Noel is a douche and no one wants him around. Take up knitting, Chris you're done in the bigfoot world. He sounds like he has been sucking on Musky's Stink gland for too long.